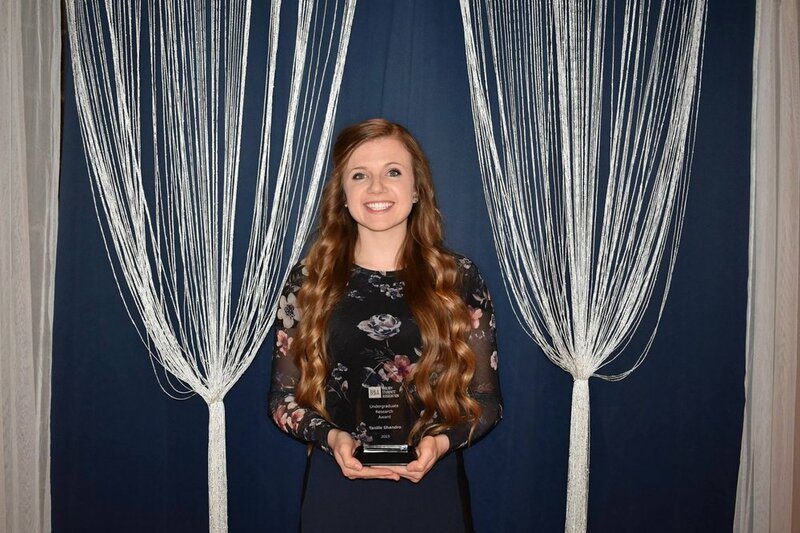 Congratulations to Tanille Shandro for winning the 2019 Biological Students Association Undergraduate Research Award! This is the only Undergraduate Research award presented by the BSA and is a wonderful way to end her Undergraduate degree. We are happy that Tanille will be staying in the MacCallum group for her Graduate Studies. Few members of our group were able to attend the 2019 Biophysical Society Annual meeting in Baltimore! The meeting is 5 full days of talks, posters and industry showcases with an interdisciplinary focus on life, physical, and computational sciences. We made a big splash with two talks given by myself, and our PhD student, Kari Gaalswyk on integrative modeling approaches. Our two MSc students both presented posters on their work  as well! We gained lots of valuable insight on our own projects and we were able to learn first hand of new emerging research in our field! Apart from science we were able to explore the diverse city of Baltimore and visited Edgar Allen Poe’s home and the National Aquarium! Congratulations to Tanille Shandro who won one of only three poster awards at the University of Calgary Undergrad Research Symposium. Great job! Our latest work “High accuracy protein structures from minimal sparse paramagnetic solid-state NMR restraints” has be posted as a pre-print on bioRXiv. We applied our MELD methodology to solid-state NMR experiments using paramagnetic relaxation enhancements and show that accurate structures can be modelled with even a small amount of experimental data. It was a great pleasure to visit Arizona State University last weekend to celebrate Ken Dill’s 70th birthday. Thanks very much to fellow Dill group alumni Steve Presse, Banu Ozkan, and Kings Ghosh for organizing. Ken was my postdoctoral advisor and is an amazing mentor. I owe much of who I am and what I’ve been able to accomplish to Ken. He taught me a great deal, not only about science, but also about people and institutions. Ken’s approach is  positive and focused around building consensus and finding mutual benefit, and I try my best to emulate him in this regard. It was also striking just how many amazing scientists have come through Ken’s lab. It is quite an impressive group that I’m proud to be a part of, with dozens of successful researchers with careers in both academia and industry. Also noteworthy was the overall quality of the presentations. Ken owes much of his success to the ability to communicate complex ideas to broad audiences, and it’s clear that this skill has transferred to those who have worked with him. The event was a great chance to catch up with old friends and make some new ones. We sometimes forget how important community is to all of us. Science is portrayed as cold and objective, but in practice it’s truly a human endeavour—we depend on each other to advance knowledge. Ken reflected on his own scientific upbringing and how it takes a village to raise a scientist. He also stressed the responsibility that we bear to be defenders of knowledge and of institutions, like universities, in the age of alternative facts. There is also a special Festschrift issue of J. Phys. Chem. B in Ken’s honour. Oh, and the weather was pretty good. Faris Fizal, a high school student who has been working with us since January, was interviewed by the CBC. Faris is preparing for the Sanofi Biogenius Canada competition, where his project involves molecular simulations of natural and engineered variants of hemoglobin to be understand their stability under shear stress, with the ultimate goal to produce synthetic blood replacements. Our new cluster, GLaDOS, is coming together. We decided to do a team building exercise at one of the escape rooms at The Locked Room. Someone with a sense of humour thought it would be fun for us to try the hardest room. We did not escape, but it was a ton of fun. Replica exchange is a widely used sampling strategy in molecular simulation. 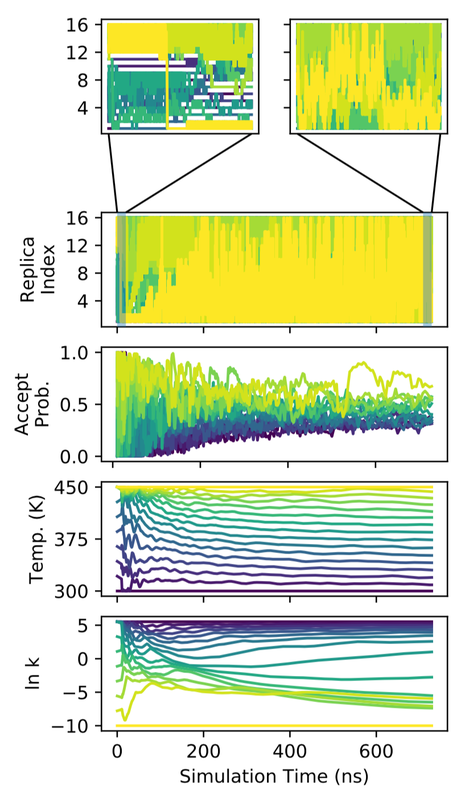 While a variety of methods exist for optimizing temperature replica exchange, less is known about how to optimize more general Hamiltonian replica exchange simulations. We present an algorithm for the on-line optimization of both temperature and Hamiltonian replica exchange simulations that draws on techniques from the optimization of deep neural networks in machine learning. We optimize a heuristic-based objective function capturing the efficiency of replica exchange. Our approach is general, and has several desirable properties, including: (1) it makes few assumptions about the system of interest; (2) optimization occurs on-line wihout the requirement of pre-simulation; and (3) it readily generalizes to systems where there are multiple control parameters per replica. We explore some general properties of the algorithm on a simple harmonic oscillator system, and demonstrate its effectiveness on a more complex data-guided protein folding simulation. Heuristics based on physical insight have always been an important part of structure determination. However, recent efforts to model conformational ensembles and to make sense of sparse, ambiguous, and noisy data have revealed the value of detailed, quantitative physical models in structure determination. We review these two key challenges, describe different approaches to physical modeling in structure determination, and illustrate several successes and emerging technologies enabled by physical modeling.